Happy 4/20 everyone! Regardless of whether appreciate the leaves celebrated on this day, I'm glad that you're interested in the leafy green goodness of MintCoin. Like people celebrating 4/20, the crypto markets were also a bit higher this week, with the first sustained recovery in quite a while. The price of MintCoin itself seems pretty stable, but who knows what the future brings? The focus remains on getting a new release out. But as usual, I was unable to resist making a few small changes to the wallet. The MintCoin logs used a timestamp format which used the localized format for the date, but a 24-hour value for time. One problem with this is that it is impossible to know if 2/7/18 is February 7 or July 2, since the USA uses a broken date format, and without context it is impossible to know whether the first number is the month or day of the month. The simple solution for this is to use the ISO 8601 date format, which is YYYY-mm-dd. We also took the opportunity to explicitly display the time zone of the logs - which are always in UTC; this was also not clear from the previous format. The translation files had a broken tag in them. This did not serve any purpose, but did cause warning messages when building the wallet. The broken tag has been removed from both of the supported languages (Russian and English). Rebelway518 on the MintCoin Telegram group decided to see if it is possible to get MintCoin running on a Raspberry Pi. We have tried this in the past, but always been stymied by the lack of memory; MintCoin currently takes almost 2 Gbyte of RAM, and the humble Raspberry Pi only has 1 Gbyte. However, there is some chance that using a compressed RAM swap space we can perhaps expand the available memory that MintCoin has available to it. One way to do this on Raspbian is with zram. Experiments are ongoing! Some users are reporting various scary Windows error messages that are preventing them from running the MintCoin wallet. We have some theories about why this is happening - such as the memory size of MintCoin growing to be too big for the 32-bit Windows wallet, or perhaps some change pushed out by Microsoft recently - but we do not really know. Maybe the new, 64-bit Windows wallet will help the situation? Maybe Microsoft will push a fix for some broken underlying system? While we don't mind anyone using the release plan for whatever they want - including translating it to other languages - please don't modify the release plan without chatting to people involved in the release! You can copy the release plan anywhere you want of course. I chose a tool that is easy to use instead of requiring accounts or approvals or something like that. It would be great if we could continue to use it. I thought that this would be the last platform that we need, but someone requested that we support 32-bit Linux. Once that is added our set of targets will be complete. This means taking the compiled programs and sending them somewhere useful. It looks like this is straightforward, but the work has to be done. No issues were closed in the official repository. There is a compiler warning when we cross-compile our Windows wallet. It is probably not super important, but we should investigate to be sure. I think we are all itching for even more exciting changes in MintCoin. This should all be possible once we get our house in order with some fixes to the old wallet. As always, please contact us if you want to help, or just fork the code on GitHub and start hacking. Happy Friday the 13th, MintCoin followers! Hopefully none of us suffers from paraskevidekatriaphobia on this lovely Friday. Trust in the crypto; everything will turn out fine in the end. We all breathed a minty-fresh sigh of relief this week as Cryptopia's MintCoin wallet finally finished syncing, so deposits and withdrawls with our biggest exchange once again became possible. It turns out that their wallet had become stuck for some reason, and they needed to re-sync. Their policy is not to use blockchain snapshots, so it took quite a while. But with some patience it all worked out - and we have a much better communication channel with Cryptopia for any future problems. The focus of the work has been getting a new release out, but I decided to spend some time working on a couple of older issues that seemed like "low-hanging fruit"... that is, bugs or small improvements that would be relatively easy yet provide some nice changes. I also thought it might be nice to close some issues! How Long Until I Can MINT!??!?! The first set of changes were suggested by Zohaib via Telegram. The idea was to let the user know how long it would be until they would have coins that are 20 days old, and so available for minting again. To provide similar information to anyone using the daemon version, the listunspent command was updated to provide information about the transaction time for each coin that you have which can be minted. A user can then figure out when each coin will be mature. So it provides more information, but also requires a bit more work - exactly how it should be for the RPC interface. You can see the txtime and txtimereceived values are present for every unspent coin. There were three "paper cuts" fixed; these are things that do not cause any major problem but are a bit annoying. These are really only to people running the code from a command line, but should have been fixed in any case. When starting the GUI wallet there were warnings about the RGP profile. This came from problems with the image files. Enlil fixed those issues. Also when starting the GUI wallet there were warnings about the Qt style sheet. There were a couple of bugs in the code which luckily only caused warnings. Finally, when starting the daemon from Linux, it would run in the background before announcing that it was starting, causing a somewhat untidy console output. Right now we know how to cross-build for Windows, and we know how to use Travis CI, but we have not yet combined the two. We are already compiling programs that we can run, but we just throw the results away. Since we have them, we just need to send them someplace more permanent. Once all of this prepatory work is done, we will be able to make a release. The good news is that future releases will be able to ship much faster, since all of the infrastructure will generate all of the runnable wallet code with every change. No new issues were added! Spring is in the air in temperate parts of the northern hemisphere. Just like all of plants trying to push their green buds out, the MintCoin developers are also trying to push something out - in our case a release of a fresh, green MintCoin wallet. All of the code changes since our last update have been related to getting the wallet to build on various platforms. Since the last update we managed to get the Windows cross-compile working... kind-of. We have a working 32-bit version of the daemon and the Qt GUI version. The 64-bit version is not working for reasons unknown; whether we need this before the release or not is not yet decided. Enlil and I also managed to get the macOS version of the wallet built, for both the daemon and the Qt GUI version. This required a bit of infrastructure magic on Enlil's part to get a machine that we can actually use to build and test it, and I am very happy with the results. Travis CI: More. Better. Lazier. As mentioned in the 2018-03-12 Mint Development Update, we are using Travis CI to make sure that changes to the code compile properly. Now that we have the macOS build working, I have extended the Travis CI builds to also check macOS as well as the Ubuntu Linux system that we started with. In the near future we should be able to also use this system for making sure that our Windows builds work too, and possibly even our ARM version. Since Travis CI is doing all the work of building the systems, we will try to use it to actually produce the executable code that we will ship in future releases. Having such a system in place can mean that we should be able to make these future releases much more quickly and reliably - that's what CI (continuous integration) is about, after all. On my development virtual machine, I notice that the user interface is basically broken when syncing the wallet. It takes ages to respond. I do not see this behavior on my laptop. Anyway, I added this issue as it should be investigated further. While getting the macOS build to work, we had to remove a broken method, which was unused. It occurs to me that there may be a lot of such methods, and we should delete them. This is a good ticket for someone who wants a kind of cleanup/janitorial ticket. A user has reported a bug! This is good because it may let us fix it. However, in this case we need more details. If you've seen a similar issue please feel free to add more data. Also, hoyanf, if you're out there, please get back to us. WARNING: This Etherpad is very much a work in progress, meant as a tool for people making the release. However, if you have suggestions or want to help then as always we really appreciate it. Eagle-eyed readers of that document may notice that we're going to be PGP signing this and future releases. If you use PGP and are willing to sign the MintCoin release key, please contact me. We will be including a snapshot of the blockchain in an optional version of the release, which should help with the initial sync. Hello again, followers of MintCoin! 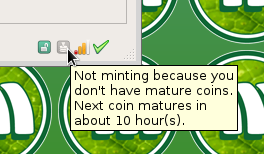 As explained in the last update, I was away for a while, and did not have much time for Mintcoin. So this will be a light update, but hopefully still interesting. In spite of there being not much development activity, there has been a lot of other activity in the MintCoin world. One thing that everybody reading this will surely know is that the crypto currency market has been crashing pretty hard. The current market cap as reported by CoinMarketCap is just over 250 billion US dollars, which is about one third of the heady heights of early January 2018. MintCoin itself has also gone down in value quite a bit, also about one third of its recent value versus Bitcoin. Rumors abound about pump and dump schemes, whales manipulating the prices, and so on. We all hope that the underlying utility of crypto currencies and MintCoin in particular will turn this around. Another non-development activity is nearly non-stop drama that has occurred in the MintCoinOfficial Telegram group. Various individuals and groups have spent a lot of time and energy being upset with each other. It certainly did not feel very minty for several weeks. Things have been quieter for the last few days, so hopefully we have passed through the storm of community unrest... and are not just in the eye of the hurricane. That's more than enough doom and gloom for one update though. Lets talk about the recent technical developments! While you need an ARM machine with 2 GB or more of RAM to run the wallet right now, it is possible and "officially" supported now, right out of the main source. I ran cppcheck against the MintCoin wallet source. This is a type of program that looks at source code and searches for common errors. It only found one possibly serious error, which has been fixed. A lot of warnings were found, which should be fixed, but these are less critical and have a lower priority. Our ever-productive Enlil has been working on a way to access your MintCoin wallet from a mobile device, and has built a Telegram bot that you can link up to your wallet. We are excited to see this kind of innovation, and look forward to seeing where it goes in the future. Something we will want to look at in the future is a way that we can make sure that the code that you run can be verified to be correct. This will prevent unscrupulous individuals from trying to get you to run a trojan program which may steal your precious MintCoins or worse! We have actually made progress on the 64-bit Windows wallet, now being able to easily build both a 32-bit and 64-bit command-line Windows wallet from Linux. The graphical Qt wallet is still not quite there, but should not be too much longer before it is ready for testing. On the macOS side, Enlil has found a way to run a macOS virtual machine without requiring an Apple computer. With that in place, we should be able to get a macOS wallet built, hopefully over the weekend but if not then surely early next week. Please contact us if you want to help, or just fork the code on GitHub and start hacking. If you live in a place that celebrates Easter, then have a great Easter weekend! If you don't then have a great weekend anyway. It may be the only time you can safely eat mint-colored eggs, so savor the special time of year. This update covers a short period of time, because I returned home on Sunday and will be leaving again tomorrow (Friday) afternoon. There has been a lot of excitement in the MintCoinOfficial Telegram group, with the community moving forward with a draft white paper, roadmap, and even a brand new web site. From the development point of view probably the most interesting part of this are the ideas around ways to decide on community priorities and provide funds to develop them, which is in the roadmap. There was also a lot of negativity in the group. We're all minting together folks; please be kind. In addition we have an enthusiastic developer named victornor who is interested in looking at lightweight wallet development. He's just getting started, but is not afraid to jump in and try stuff out. No new issues were added in the few days since the last update. However, all fixes to the wallet from my personal repository have been merged upstream, except for the ARM CPU build. At this point, the code is ready for a new wallet release, once we figure out how to do Windows and macOS builds. As with last week, we may be able to get an Apple machine lent for the purpose of building, or we may rent a macOS Virtual Private Server (VPS) for this. I'll be traveling for all of next week, so I will skip the next development update. Look forward to one around the end of March, when hopefully we will be talking about the new wallet release.